It's been a long time since there's been this much buzz in the laundry detergent category...not to mention from the long-time industry leader Tide. A personal favorite of mine. 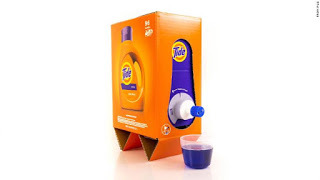 Tide in a box. Actually Tide in a bag in a box. With a easy-flow spout (my words). Easy to use for sure. But also much easier to ship (probably much less damage I would imagine). And 60% less plastic. Completely e-commerce friendly. Yes, it looks like wine in a box which many have quickly pointed out. But it couldn't be more clearly branded, and it's not the first spout ever in the category. Easy to use, easy to ship, less plastic. Sold.